RARE: Raj Kapoor’s “Mera Naam Joker” sweetbox made for Russia! In 1970, the world witnessed the release of Raj Kapoor’s maganum opus “Mera Naam Joker,” a 255-minute spectacle about a clown who makes the everyone laugh, but cries within. This Chaplinesque saga was made over a period of six years and had Raj Kapoor investing large amounts of his personal fortune in order to complete the movie. However, it was a disaster at the box-office, causing great monetary loss to Raj Kapoor. In the years that followed, however, the film garnered critical acclaim and is considered to be a milestone in Hindi cinema, today. It was distributed under the RK Films banner and the star cast included Raj Kapoor, Manoj Kumar, Simi Garewal, Dharmendra, Padmini, Rajendra Kumar, and Dara Singh. The music was scored by the duo Shankar Jaikishan. The film also marked the debut of Rishi Kapoor and was shot on location in India and Russia. In Mera Naam Joker (My Name is Joker, 1970) Raj Kapoor presented the prowess of Russian circus and ballet. The protagonist, Raju, falls in love with the visiting trapeze artist Marina, played by Kseniya Ryabinkina. Raju and Marina get close despite the language barrier. The brief affair ends with heartbreak as Marina returns home with her troupe. Ryabinkina’s role was reprised in Chintuji (2009) a movie based on the life of Raj Kapoor’s son and actor Rishi Kapoor. Marina returns to India after 40 years and visits the site where their circus had performed. She meets Raju’s son, a part which Rishi Kapoor had debuted with. 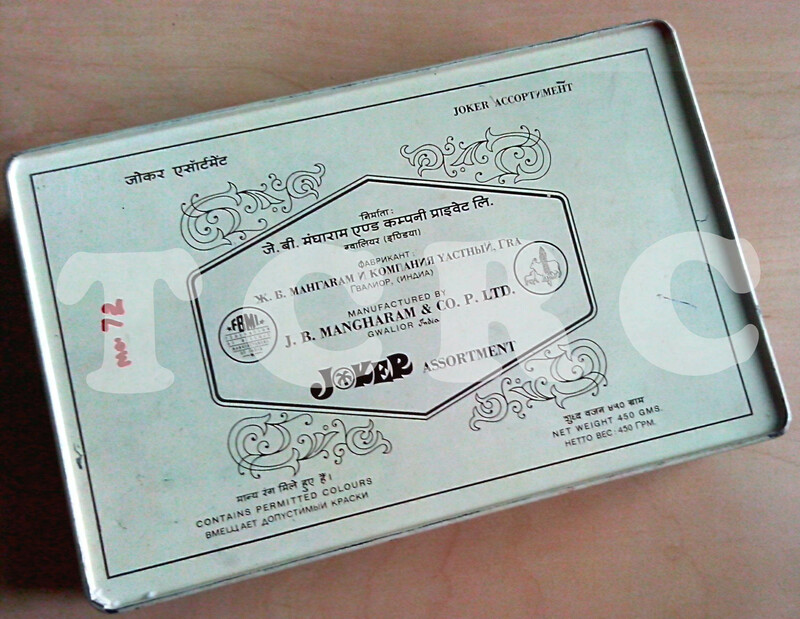 Today, we at TCRC bring to you a sweetbox made by JB Mangharam & Co in Gwalior for the Russian release of “Mera Naam Joker.” Notice the markings in Hindi, English and Russia. Called the “Joker Assortment,” the box is a favourite of ours at the archive here!